Home security isn’t something to take lightly. Having external cameras on your property can boost your home security, and the Kuna lighting and camera combination provides a stylish alternative to standard outdoor security cameras. Whether you live in the city or out in the country, there are always security concerns outside your home. Whether it’s vandals trying to pick the lock on your front door, or vermin foraging through your garden while you’re away at work, an external security camera can bring you a peace of mind that few other security solutions can. The Kuna security light is somewhat unique in that it combines the usefulness of an outdoor security camera Build a Motion Capture Security System Using a Raspberry Pi Build a Motion Capture Security System Using a Raspberry Pi Of the many projects that you can build with the Raspberry Pi, one of the most interesting and permanently useful is the motion capture security system. Read More with the aesthetic appeal of a high-quality, beautiful outdoor light. With three different styles to choose from – two of them in black or bronze – you’ll likely find one that looks really good mounted outside of your home or business. 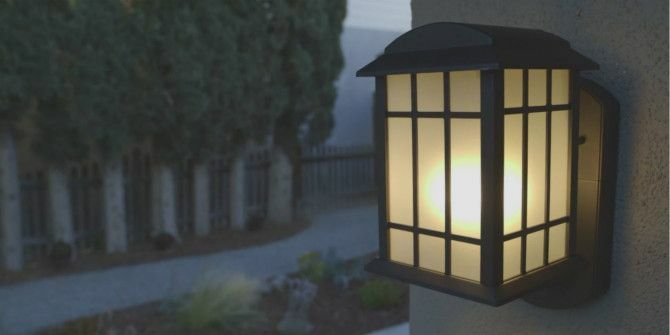 Read on to find out how you could win your very own Kuna external lighting security system, worth $200. Compared to my old external lighting unit, the Kuna is quite a bit larger, at about two inches taller and an inch wider. However, where my former external light was mounted on a full cast-iron body, the Kuna aluminum sconce felt a bit flimsier and lower quality. Going with a bronze color may be smarter, since the black body gives it the appearance of a plastic electronic device. The body of the sconce itself, and the mounting bracket, has the feel of solid aluminum though, and I have no doubt that it’ll be capable of withstanding the elements of a Maine winter. I do wonder how to camera, microphone and the electronics will hold out in sub-zero weather though. The camera that is mounted below and slightly tucked behind the sconce itself is easy to miss unless you look directly at the light itself, which few visitors ever bother to do. The painted black round camera body blends in with the rest of the unit, and is held firm behind a rotating locking ring that you can tighten or loosen to re-position the direction of the camera. The camera is then fixed, with no remotely controllable pan/tilt features. In our case, I was able to loosen the ring and swivel the security camera How to Build a Security Camera Network Out Of Old Smartphones How to Build a Security Camera Network Out Of Old Smartphones There's no better use of old smartphones than by building your own DIY network security camera system -- we show you everything you need to know! Read More off to the right so that we can capture a bit of our walkway, as well as the part of our porch where people stand before opening the external door. This provides time for the camera to get a clear shot of every visitor’s face as they enter the home. The value of this for us is that if thief ever breaks in using the main entrance (either breaking the window and unlocking the door, or picking the lock), a clear image of the perp’s face will already be captured and uploaded to the cloud. In fact, this is the most likely scenario if a would-be thief approaches the main door of your house to break in. You will instantly receive an audio alarm on your phone that someone has arrived at the door. Using both the live video feed and the recorded video, you can determine whether that person is a stranger who shouldn’t be there. You can either press a button to talk to the stranger, or simply enable to loud audio alarm to scare them away. If the person doesn’t leave, you can dial 9-11 about a robbery in progress at your home. Even if the person gets away, and even if they destroy the camera, you’ll have their face captured to the cloud to share with police. The folks at Kuna aren’t kidding when they list that the unit comes with a high-fidelity speaker for the alarm. When I first tested the alarm, it was quite startling. It is a 100 dB alarm that I could hear clear across the property and over at my neighbor’s property. It’s a lower-pitched 100 dB emergency-horn, as compared to the screetching 85 dB alarm of a standard U.S. smoke detector. So it’s a little louder, but not as ear-shattering. Beyond just the security benefits of having a video-alarm motion-detection system How To Build A WiFi Home Surveillance System With Your PC How To Build A WiFi Home Surveillance System With Your PC Read More outside your home, is the peace of mind of being able to keep an eye on your family while you can’t be home. If you work all day, or if you have to travel for businesses for a week at a time, there is nothing quite as comforting as being able to watch the comings-and-goings of your family members as they spend time outdoors, or just come and go during the day. Personally, this is my favorite thing about owning a Kuna. My family and I have even had conversations over the system (sort of like a cloud-based intercom How To Build Your Own Baby Monitor How To Build Your Own Baby Monitor If you're a recent parent, you've probably considered getting some sort of baby monitor. You possibly considered the utility of a video monitor and then you may or may not have balked at the exorbitant... Read More ) while I was sitting at my desk at work – very convenient! The current first-generation Kuna app via either Google Play or iTunes App Store, free to install and use with your Kuna security light, is pretty simple to use. After you first install your light and then the Kuna app, you’ll need to add your camera to your Kuna cloud. Initially, you need to use bluetooth What Is Bluetooth? [Technology Explained] What Is Bluetooth? [Technology Explained] Read More to connect with the Kuna light and add it to your network. If you have multiple Kuna lights, this is where you’ll add them one at a time, to your network of security lights. Once you’ve connected to the Kuna via Bluetooth, you’ll need to tell it which wireless network you want it to connect to. At my house I use two sub-networks via a bridge How to Turn an Old Router Into a Wireless Bridge How to Turn an Old Router Into a Wireless Bridge Not sure what to do with your old router? Try turning it into a wireless bridge! The process is surprisingly straightforward. Read More , and the Kuna recognized both of them as valid networks available to connect to. Once you give it the network password, it’ll connect your new camera to the network, and also the secure Kuna cloud network. Initially, I had preliminary problems getting my app to correctly connect to the camera (it displayed the camera as offline when it really wasn’t), and to display the live video feed in a timely manner. When someone arrives at the door, I’d really like to instantly connect to the camera so I can catch them at the door. I don’t want to see a loading icon for 25 seconds. By the time the camera feed shows, they’ll be gone! The good news is that within 24 hours, these kinks worked themselves out. I’m not sure if the Kuna folks were fixing things on the back end, but I did notice the next day that I had absolutely no problems connecting to the live feed of the security camera – with maybe a 5-7 second load-time, which is reasonable. Playback of each motion-detected session worked flawlessly – I captured myself playing around with the app while standing right in front of the doorway. I did have another temporary issue with playing back a few recorded messages – but again, that issue appeared to resolve itself after a few more hours of using the camera, and never happened again. After a day or so, once all the kinks seemed to work themselves out, testing the camera worked seamlessly. Whenever you open the app, you’ll see a thumbnail image of the latest still from the security camera. What I loved about this is I could just open up the app and see whether or not my family was home (car in the driveway). Then, it dawned on me that this could also be a security flaw if a hacker could gain access to your camera. They could figure out whether you’re home or not, or worse, review the recorded motion-detected videos to ascertain the time of day when you typically leave your home. Obviously choosing highly-secure passwords for your Kuna cloud account is very important. We’ve offered lots of advice in the past here at MakeUseOf about protecting your security cameras 5 Security Concerns to Consider When Creating Your Smart Home 5 Security Concerns to Consider When Creating Your Smart Home Many people attempt to connect as many aspects of their lives to the web as possible, but many people have expressed genuine concerns over how secure these automated living spaces actually are. Read More from this threat – those are worth a read Hack Attack: How To Keep Your Webcam Secure From Online Peeping Toms Hack Attack: How To Keep Your Webcam Secure From Online Peeping Toms What would you do if someone had control of your webcam without your knowledge? Fortunately, there are ways to keep yourself clean from these online peeping Toms. Read More . Testing of the live video conversation with a visitor worked almost-flawlessly. I say “almost” because with my Samsung Galaxy’s volume at 30%, I couldn’t hear my daughter talking, and contacted the Kuna tech contact for some help troubleshooting. They suggested making sure my phone’s speaker wasn’t muted (well, of course Ms. Obvious! ), but as it turned out that was sort-of the answer. I needed to turn my phone’s volume up to 100% to clearly hear sound from the Kuna’s microphone. Once I did that however, the sound quality was very good – the Kuna captures everything during the recorded video sessions. I could hear planes in the sky, cars passing by, and even the wind in the trees in the back yard. You can go back in time and see every single motion-activated recorded video event. You can manage them all right from the app, whether you want to watch them, download them to your device Your Cloud Media Center: How To Stream Videos From Dropbox Your Cloud Media Center: How To Stream Videos From Dropbox You'll want to watch your videos on your laptop one day, and on your media center the next. A simple solution to this problem can be found with Dropbox, but not the way you're thinking.... Read More , or delete them. Currently “Cloud Recordings” is a free feature while the Kuna folks are working out the bugs, but I can only assume this will soon become a fee-based “premium” feature since these video recordings are sure to consume a great deal of space over time. A preview of the plans shows that the minimum pricing is $50/year, per camera for unlimited 7-days worth of recordings. You can of course save these to your device for more permanence should the need arise, but you may want to consider if this inevitable ongoing cost is acceptable to you. It would be nice to be able to further customize the motion detection capabilities of this device. You can currently set the motion sensitivity from 0 to 100%, but it would be helpful to add a delay to the motion activation so that you could ignore the 10-15 seconds when you’re arriving or leaving the house. This would allow you to only capture video when someone is standing outside of your locked door and knocking, or trying to get in. Currently you can set up when you want to receive alerts every time the motion detection goes off or not, and you an also set the Kuna security light to “disarm” on a specific schedule, for instance to only receive alerts and video recordings when you’re at work. The light schedule is useful. You can set up the light to turn on at dusk and off at dawn. Or, if you’re more energy conscious, you can turn those off and instead use the “Motion On” feature so the light turns on when you are at the door. As a side note: don’t be misled by the specification listed on the Kuna site (as of this writing) that this device has “night vision”. By night vision, they mean that the motion-detection will turn on the light at night so that the Kuna can still see what’s there. The device does not have actual IR “night-vision” capability. The Kuna team advised us that they will be revising their website to make this more obvious to potential buyers. One final observation on using motion to control the light is that currently the time delay between motion sensed and the light turning on is not as fast as it should be. Even with motion sensitivity set at 95%, I find that the light turns on only after I’ve been standing at the door for 3 seconds, rather than when I’m approaching the camera from my walkway, which is when I’d really like to see where I’m walking. Aside from those minor issues, I find the Kuna security light a tremendous improvement over the old-school external switch-controlled light. I find myself using the Kuna daily to keep an eye on my family and make sure everything is safe at home. Explore more about: Home Security, MakeUseOf Giveaway, Smart Lighting. Linedock: The Best MacBook Pro AccessoryYour Smart TV is Watching You – and It’s Not the Only One! I just installed two of these, great product so far. Video quality is excellent, even without night vision. I was worried about the light washing out the video at night (the light is right above the camera), but no problem. Notifications work well, still fine tuning the sensitivity settings. One thing not noted is that the camera actually records about 20 seconds of video before the event that triggers it -fantastic!, you can see events leading up to the trigger, not just the back of someone leaving the frame. 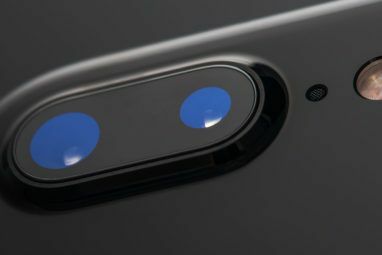 It is also claimed that the camera uses a combination of passive infrared and computer vision, to trigger events. This must have some validity, as the light does come on sometimes (cars, animals and such), but no alert, and no recording. However if there is a person, I get alerts and recordings, not missed one yet.